Almanac White & Red are real, farm-grown wines. 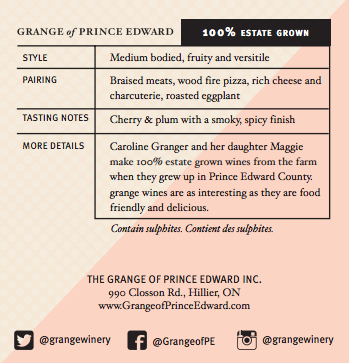 At the Grange all our wines are grown on our family farm in Prince Edward County. Caroline Granger and her daughter, Maggie grew up in the County and know the land well. They make wines that taste like a unique place. These wines are available in 120 LCBO locations across the province; from Windsor to Thunder Bay to Cornwall. Almanac is a taste of Prince Edward County, wherever you are in Ontario. The LCBO allows for home delivery (small fee) and store delivery (free) to get these wines into a location near you .